In all my decades as a music fan it never ceases to amaze me when I stumble across another huge talent who is virtually unknown (or certainly is to me!) and I just wonder why, with all that talent, they are not household names! My musical preferences have always gone in the direction of people who don’t kow tow to the preconceived ideas of the big commercial companies, instead ‘staying true to themselves’ and their own fully formed vision of the music they feel more comfortable with and have some control over. These indeterminate boxes are all ticked by this highly talented singer songwriter, along with the other two members of her band who contribute so much to her highly individual sound. written songs. Melissa really is a huge talent who will hopefully soon be known to many more, or certainly should be! The band consists of Melissa on rhythm guitar and vocals, Johnny Leal plays some highly skilled lead, slide and rhythm guitar as well as bass whilst the excellent Jimmy Leal is on drums. Everything has a lovely open sound on which nothing gets in the way of Melissa’s vocals but at the same time the instruments have a lovely separation and clarity which allows them to shine and get the best out of the gorgeous melodies, a testament to Melissa’s superb production techniques. 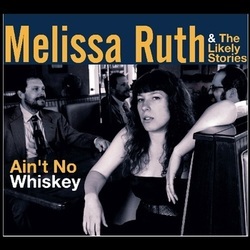 You need a lot of confidence in your ability to portray your songs when instrumentation is this sparse and it is that sparseness that allows the warm, sensual emotion and maturity of Melissa’s vocals and the quality of her poetically evocative lyrics to shine through and guide everything on this excellent album. Boxcar a chirpy upbeat story could well be a biographical snippet!. album, with it’s clarity and sparseness, gives a recording that easily carries itself, a further lift. Brilliant album!